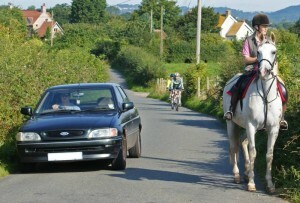 A horse rider is in the left-hand lane approaching a roundabout. Where should you expect the rider to go? A horse rider is in the left-hand lane approaching a roundabout. Where should you expect the rider to go?